For Book Order Blank See Bottom of Page. The surname of Davis originated from David, with two possible roots; the Welsh patron St. David and much further back, the ancient tribe of David. The ancient Hebrew name of David translated is "beloved" or "loved by God"; certainly, to Davis researchers, he must have loved us very much as there are so many of us. Interestingly enough, the Christian name scarcely appeared in England, before the Norman conquest. According to Sir John Bernard Burke's "General Armory of England, Scotland, Ireland, and Wales" the numbers of David based surnames entitled to coats of arms are: Davey - ? ; David - 9; Davidge - 1; Davidson - 8; Davie - 5; Davies - 28 (with variations under some); Davis - 27 (with variations); Davison - 5; Davy - 14; Davye - 2; and Davys - 4 (with variations). Those hearty Davis immigrants who settled in Pennsylvania brought with them the professions, trades and skills they had practiced in their old countries. Some of the earliest occupations were farmers or yeoman (as you will commonly see in wills), physicians, weavers, tailors, politicians [Thomas Davis, constable/sheriff - Chester Co, PA 1722], papermakers [Garret Dewees of Krefield] and ministers (too many to cite). The following list includes the Davis and spouse's name with a year to indicate a birth (b or a), marriage (m), death (d), or resided (r) in Pennsylvania. Persons mentioned in wills have a year with a (w) after it. Also in the year field a (g) would represent granted land, (i) immigrated, (t) tax list and (c) census list. "The Davis Directory of Pennsylvania"
Hezekiah Davies full list of more than 500 officers who were imprisoned on Long Island, Philadelphia burial records, War of 1812 pension applications, wills and other court records of early counties. The unique index alone is invaluable and makes searching for your Davis a pleasure. A calendar of dates in Pennsylvania history to aid in studying family movements both within the Commonwealth and to other states. Please return the order form below with your check or money order. Please send _________ copies of "The Davis Directory of Pennsylvania"
at $53.00 postpaid per book. My check or money order for $___________ is enclosed. 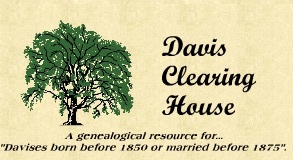 "Davis Directory of Virginia" now in preparation so add your name to history and send your lost DAVIS ancestors.